Do you have to make Easter Basket for your children every year and you’re wondering, can you prepare a frugal basket? Check out how you can make a pocket-friendly Easter Basket this time. Also know how to prepare budget-friendly Easter lunch and dinner menu. 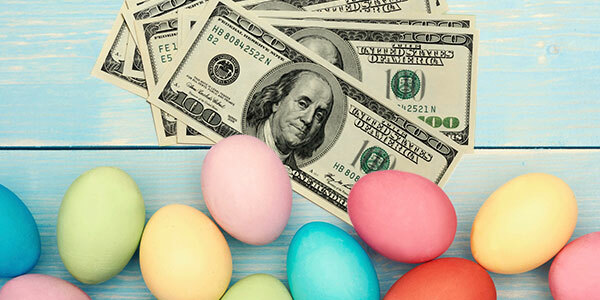 Easter is around the corner when you might be still struggling with holiday debt. But that doesn’t mean you’ll add up to that debt, nor it means you’ll compromise with your enjoyment. Easter Basket brings lovely memories of childhood. You might recall cherishing memories of Easter egg hunting games of your childhood and want to create memories for your children, too. Several researches have revealed that on an average, people spend about $150 on an Easter Basket. So, if you have 2-3 kids, multiply the amount accordingly. However, this time, you can prepare a unique basket in a much pocket-friendly way. Also, check out how to have budget-friendly Easter lunch menu and dinner. If you have 2 or 3 children and you have to make Easter Basket for each of them, then it’s better you plan a budget for every child, as per their choices. It will help you plan the basket. Not only the baskets, you can reuse quite a bit of things. Wondering what? You can reuse the plastic Easter eggs. If required, just wash and reuse them. If you don’t have a basket to reuse, you can make one. Search the internet for easy and creative Easter Basket ideas. Alternatively, you can use or purchase traditional brown lunch bags (usually $2 per 100 bags) and decorate them. You can also use a toy packet for the purpose. Encourage your children to decorate them as they want to. This way, they can create their personal Easter Bag. While making a pocket-friendly Easter Basket, make sure you don’t purchase non-essential items. Instead of buying Easter grass, fillers, or paper shredders, store the ads from newspapers and use a shredder to have colorful pieces of paper. You can also use colorful tissues for the purpose, too. Even plain ones can be used for a unique but frugal Easter Basket. Another trick is to make the arrangement in a smaller basket. Doing so, you don’t have to fill your basket with non-essential items. Your basket will automatically look full of candies and snacks. Once your basket is ready, next comes fillers for your basket. This is the main area where you need to plan to create an Easter Basket on a budget. Instead of being conventional, you can choose uncommon items which your children love. You can browse online for unique Easter Basket filler ideas. Before you purchase anything, it is advisable that you comparison shop. Doing so, you’ll have an idea about the new things you can buy and which store is offering the items that you want to buy at a cheaper rate. It will also help you select items for your basket. Often the stores offer coupons, which you can store and use during this time. You can also print seasonal candy coupons from certain websites (coupons.com, smartsource.com, etc.) to get discounts. There are only a handful people who don’t love candies. It hardly matters how old you are, chocolates are sure to bring a smile in your face. You can buy gummy candies, lollipops along with marshmallows and assorted chocolates. If you are looking for healthy Easter Basket ideas, you can fill the baskets with fruit snacks, chocolate covered fruits, dark chocolates, peanut butter eggs, chopped nuts and similar nutritious food items. Books are one of the best gifts to give your children. Buy books as per their liking. You can also take the opportunity to gift books that will enhance their knowledge. Beautiful toys - Another essential thing in an Easter Bag. You can choose toys according to the age of your child. The stores keep uncommon toys during these time. Since the occasion is Easter, you can include religious items in the basket. A coloring book of Bible stories or an illustrated Children’s Bible can be a beautiful gift. Little ones are full of energy and engaging them with crafts is a good way to utilize their energy. You can visit Michael’s for different types of Easter Basket craft ideas. You should include some accessories to complete the basket. If you’re making the basket for your little boy, then you can buy baseball caps, sunglasses, etc. and if it’s for your little girl, then you can shop for flower jewelry, cosmetics, nail decorations, colorful beads and so on. You can also search for accessories that you can gift both to the little boys and girls. Some stores usually offer items at discount rates. If you buy from these shops, then it’ll be easier for you to avoid making an expensive Easter Basket. You can visit a dollar store close to your home for affordable basket goodies. Also, check out Michael’s, Jo-Ann Fabric, and Craft Stores for goodies at even less than $1. Target is also a place that offers candies and themed baskets. Good candies are also available at the medicine stores like CVS and Walgreens. Buying readymade baskets doesn’t mean that you’d have to pay more. Some stores offer such Easter Baskets at a reduced rate. You can get one around $15 at Toys R Us and Target. Why don’t you start planning for the next Easter from now on? No, you don’t have to buy baskets and candies for next year. But, take advantage of the Easter clearance sales. You can get items at about 70% off. So, shop non-perishable items and be prepared for the next Easter. Now that you’ve got ideas to make the budget-friendly Easter Basket, it’s time to prepare budget-friendly Easter lunch and dinner. Easter is not only about egg hunting; you can have delicious eggs, too. Cut the hard-cooked eggs in half along the length. Slip out the egg yolks and mash them with a fork. Take the egg whites and scoop a little from the bottom so that they sit well on a plate. Fill the egg whites with the prepared mixture and heap up lightly. Refrigerate for about 24 hours. Sprinkle some greens of your choice and serve. Not only making a healthy Easter Basket, it’s time to have a healthy and nutritious salad, too. Take a saucepan, combine sugar and water, simmer, and stir occasionally till dissolved. Remove from the heat, stir lime zest, and let it cool to room temperature. Take a large bowl, mix strawberries and mangoes. Add the prepared syrup and serve. Instead of buying the soda from a store, prepare a drink at home. Take a container, pour water, add ginger and sugar, cook over medium heat and bring to boil. Stir occasionally to dissolve sugar. Strain the liquid into a pitcher and cool. A perfect dish for a family get together. Chicken tenders - 1 and ½ lb. Take a large bowl, place chicken tenders, sprinkle salt and pepper, add flour and coat the chicken pieces. Take a large nonstick skillet and heat half of the oil over medium-high heat. Add half of the chicken tenders and cook for about 4 min. until golden brown on all sides. Put the chicken on a plate and repeat the same procedure with the remaining chicken. Add curry powder, onion, and ¼ tsp. of salt and pepper and cook while stirring until onion softens. Add broth to the pan and bring it to boil. Reduce the heat and simmer for about 3-4 min. until the sauce gets reduced by half. Put chicken into the pan, turn and cook for 2 min. Add broccoli and cook for 2 min. while stirring the mixture. Put the chicken and broccoli into plates, stir in sour cream to the sauce and then pour sauce over the chicken and serve. An easy to cook but good to taste dinner recipe. Fully cooked smoked bone-in ham - 6-8 lb. Dijon mustard - 2 tsp. Heat oven to 325°F. Place the whole ham on a shallow roasting pan and place it on the rack. Roast for about 12-16 min. per pound until the thermometer reads 120°F. Remove the ham from the oven and pour drippings from the pan. Cut the surface in uniform diamond shapes. Take a bowl, mix brown sugar, honey, mustard and brush on the ham. Roast it uncovered for about 20 min. or more until the thermometer reads 135°F. Cover the meat with foil and let it stand until the thermometer reads 140°F. Place the ham on a carving board with fat side up, cut slices and serve. Enjoy your Easter wholeheartedly without worrying about debt and budget. Happy Easter celebrations! Page loaded in 0.992 seconds.